On 26th Dec 2015 Phuket, Thailand – PLAJA held the 11th memorial service for Indian Ocean Tsunami Victims at Sunwing Kamala Beach Resort, Phuket. There are messages for the memorial service as below. There was the 10th anniversary of memorial service last year and it was considering it as an end of the memorial service. But we, general incorporated association PLAJA, determined that we would continue to hold the service as long as we can. Because we should not forget the fear of disaster and the misery from disaster. We should not forget the sense of crisis. From such a thought, we hold the 11th anniversary of memorial service for Indian Ocean Tsunami Victims today. On behalf of general incorporated association PLAJA, I would like to take this opportunity to appreciate the support from the All Japan Buddhist Association, Nichiren section from Japan this year as well. I hope to see everyone again here next year as well. Again, I would like to say thank you from the bottom of heart for your attendance today. And, I would like to pray for the happiness of all of you. Once again, I would like to send deep condolences to all of those who were sacrificed by the Sumatra earthquake that occurred on December 26, 2004. And I would like to sincerely sympathy to members of the bereaved families who attend the memorial service today. In addition, I would like to thank you to President of PLAJA Mr. Kanke and members who have put efforts for the 11th anniversary of memorial service in order to comfort the spirits of those who have been sacrificed. 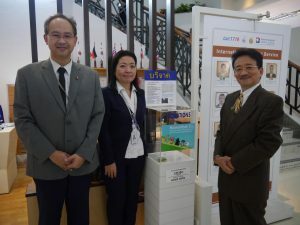 The Embassy of Japan is appreciate to PLAJA that takes care of the memorial monument of Indian Ocean Tsunami Victims, to Phuket Japanese association and the residents who had made efforts to memorial monument erected in 2005. Also, we appreciate the Kamala Beach Resort that provide the area for the memorial service in such a long time. I would like to express once again deep gratitude. Indian Ocean tsunami 11 years ago brings the horrors of unprecedented, it has deprived the precious lives of many people. Among them, also includes our colleague who was working at the Thai Embassy. Now, I am standing in front of the memorial monument, I feel the deep sorrow of victims and the sadness of the remaining bereaved family. Disaster takes away the lives of people in an instant, destroys economic and social infrastructure and it also afflicts even the survivors. It is a big threat to the individual and society. You may know that the Third United Nations Conference on Disaster Reduction has been held in Sendai, Japan which Thailand prime minister Prayut also participated this year. Regarding the conference, Japan announced the “Sendai Disaster Reduction Cooperation Initiative” to further advance the contribution to the international community in disaster prevention. It has announced that it will continue to strengthen cooperation of the development of human resources involved in disaster prevention and reconstruction of the country, to develop such a strong disaster infrastructure. I sincerely hope commitment to disaster prevention in each country when victims of disaster reduced even a little in the future. At end, I would like to extend my condolences to the victims of Indian Ocean Tsunami. I wish the success and prosperity of beautiful Phuket island referred to as the pearl of Andaman sea. Usually December is a very busy month to earn money for people who run business in Phuket. Because it is the busy period is only two and a half months until early March from December, it must be earned money for one year in the meantime. People feel the heavy pressure and full of tension to overcome the high season. It was the same as every year eleven years ago until that catastrophe occurred.. However, after the experience of the disaster I became to watch objectively the situation apart from the today’s target, calmly simulate the future. Of course I should make an effort for the goals but also I have accepted the situation if the unexpected things happened. My house is a distance about 100 meters from Patong beach and it was severely damaged by the Tsunami. Indian Ocean Tsunami is a memorable catastrophe. In the past few years, there are various incidents, accident or crime. The world has been increasingly violent when I see the news. Although it was an outrageous disaster I experienced, I think there was some sort of salvation because it was a natural phenomenon. If it is a man made disaster or terrorism, it is more horrible pain and shock receiving from Natural disaster. I personally think this memorial service is what to remind the humble feelings once a year. I would like to appreciate to general incorporated association PLAJA and related parties to give us this opportunity and to have made the effort in the memorial service for Indian Ocean Tsunami victims.